Warning: this blog post is really personal! Last night I (Ruth) had a wake-up call, one of those moments that reminded me of how easy it would be to damage the beautiful relationship Michelle and I share, and I wanted to share it with you. I’d had a phone conversation with my mom, and heard some hard news about my father and sister, who are both mentally ill addicts. Afterward, Michelle and I sat at the kitchen table and I told her about the conversation, feeling grateful that she accepts me despite my screwed-up family. Then Michelle got up, came over to me, and kissed me on the forehead, and then gently started kissing my lips. It was so sweet, and felt so good. I took it in for a second, and then I felt a wave of sadness that she doesn’t do this more often. Our relationship has a lot of physical affection, but I’m almost always the one who initiates it. Michelle always welcomes and responds to my hugs, kisses, pats and squeezes, and I touch and squeeze her many times throughout the day. But, Michelle just doesn’t tend to reach out in that way herself. We’ve talked about it many times, and I understand that this is just her personality. I don’t take it personally. At least, I didn’t think I did! “Yes,” I agreed, without saying more. 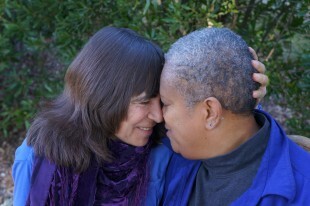 “People do that all the time,” Michelle said, thinking of the many couples she’s coached. Now, because Michelle and I have a lot of trust and good feeling between us already, it wouldn’t all have gotten ruined from one comment. But over time, these small moments are what make – or break – a relationship. What’s wrong with me? Why would it be my first impulse to ruin a moment that felt good, by complaining about the other moments in which that same thing hadn’t happened? Well, I could try to analyze this by talking about my childhood, but the truth is, this is a pretty widespread human tendency. Who knows, maybe it’s left over from our biological programming to cry and scream in order to get fed as infants?! On some unexamined, unconscious level, we act as if we believe that criticizing or complaining will get us more of what we want. How crazy-making! First, she would probably have said, “What do you mean? I’m doing it right now!” Then she would have felt bad, flawed, unlovable and defective (or, if she were someone else, defensive, irritated and angry) and would have withdrawn. She certainly wouldn’t have felt like lying in bed and cuddling. And, the odds of her reaching out and initiating affection again in the future would definitely have gone down. But I know now that the blaming approach is what I used to take all the time in my relationships. Over time, my partners would meet my needs less and less, and I would feel angry and deprived and hurt without ever seeing the part I had played. And my guess is that some of you who are reading this do the same thing… or, perhaps you have a partner who does this. Or maybe this kind of dynamic is part of what destroyed a past relationship. Whatever your history with complaint and criticism, the take-home message is:there is a way out of these kinds of destructive communication patterns and emotional dead-ends! I am sooooo grateful that I have the mental health and wherewithal to practice a different way of communicating – and so glad to have the chance to help you do that, too. Especially since my father – who used to be a doctor and professor – is living in an RV in a Walmart parking lot, but refusing help (other than money with which to buy more drugs). And my sister is living with a man who chokes, trips and threatens her, but again, refuses help. I’m often stunned that I get to live the life I live, while two of my three closest family members have self-destructed so completely. I know there’s some luck and some genetics involved. But I also believe a lot of it is choice. There’s so much pain in this world, and inside of each of us. But we get to choose what we do with it. That’s what being a “conscious girlfriend” is all about. If you’re single and this way of being speaks to you, I hope you’ll consider taking our 12-Week Roadmap to Conscious Lesbian Dating and Lasting Love, It’s a comprehensive online course that will give you the “roadmap” for finding – and being – the kind of partner you really want.